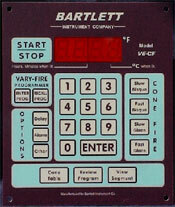 The V6-CF is Bartlett Instrument Company's fifth generation kiln controller. 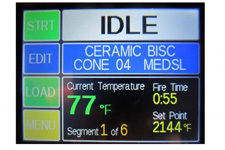 Each generation has improved the reliability, features and ease-of-use to make Bartlett Instrument Company's kiln controllers the most accepted on the market. With the V6-CF cone-fire method, you select 1 of the 4 firing speeds and your cone number and you're firing your ceramics with as few as 6 key presses! The vary-fire method gives you the freedom to create up to six, 8-step user programs to fire your ceramics, crystalline glazes, glass or jewelry. 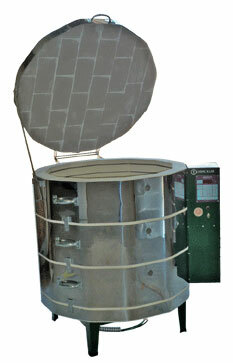 Olympic Kilns introduces it's newest controller for use on all electric kilns - GENESIS. The controller provides an intuitive user platform which will make entering data for firing programs easier and more informative with it's touch-screen user interface. Inner Dimensions 28.25" x 27" Inner Dimensions 28.25" x 27"
Exterior Dimensions 42" x 41" Exterior Dimensions 42" x 41"
Big value and high quality are the main idea behind the new Olympic Medallion Artist Series kilns. Features like 3 inch kiln brick, heavy duty elements and digital controllers are some of the things that set the Olympic Medallion Artist Series apart from the competition. Especially when you consider the price. If you have questions, please feel free to contact us at 1 (888) 838-3625 or contact us by email at sales@clay-king.com for correspondence by email. 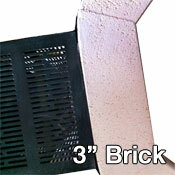 Our knowledgeable staff is here to answer any questions you might have about your kiln purchase. 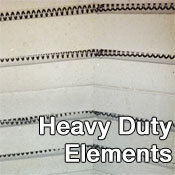 Less energy consumption due to 3 inch brick and heavy duty heating elements. Affordable and fun to use!